This article has new content coming soon from Halo 5: Guardians, and may not be complete, confirmed or correct. Please update it as soon as any relevant and accurate material is available. Jul 'Mdama's Covenant is destroyed. Avu Med 'Telcam is killed. The Blooding Years is a series of conflicts fought between the Swords of Sanghelios and various Sangheili factions on Sanghelios since 2553. In the aftermath of the collapse of the Covenant, the Sangheili found themselves in political, military, and religious turmoil. Having long depended on the San'Shyuum for political leadership, the Sangheili found that they lacked any form of political organization beyond their traditional feudal states. While Arbiter Thel 'Vadam began the process of forming a new government to lead Sanghelios and its various colonies, many kaidons began hoarding ships and weapons for their own agendas. Additionally, while most Sangheili renounced the Great Journey, many did not wholly abandon worship of the Forerunners. As a result of this, the Servants of the Abiding Truth, an ancient order of monks, began preaching a return to the Sangheili's ancient ways of worshiping Forerunner artifacts. Consequently, they felt that Thel 'Vadam and those loyal to him were committing blasphemy by saying otherwise. Avu Med 'Telcam, a former Field Master, began recruiting dissident Sangheili into a force to rise up against the Arbiter's followers. Admiral Margaret Parangosky, of the Office of Naval Intelligence, believed that keeping the Sangheili mired in internal dissent would leave them unable to threaten the weakened UNSC. This opinion contrasted with that of most of the Unified Earth Government, which believed a peace treaty was desirable. ONI took advantage of the Sangheili's unstable political situation, attempting to keep the Sangheili splintered and disorganized by inciting the Servants of the Abiding Truth to rebel against 'Vadam. ONI's aid allowed the Servants of the Abiding Truth to amass enough weapons to begin an all-out insurrection against 'Vadam and his allies in early 2553. Thel 'Vadam leading the Swords of Sanghelios. Following the end of the Human-Covenant War in March 2553, an attempted Jiralhanae insurrection in Ontom led Avu Med 'Telcam, leader of the Servants of the Abiding Truth, to the decision for an immediate assault on the state of Vadam. Along with nine ships and forces from Nuan keep and Rtova keep, 'Telcam commanded the assault from the frigate Unflinching Resolve. Eventually, however, the Unflinching Resolve suffered a direct hit and crash landed. 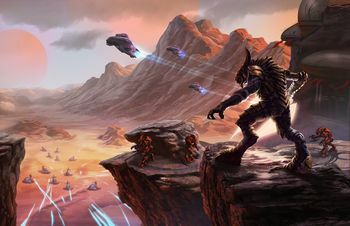 Despite being caught off-guard it appeared as though the Arbiter would be victorious, however, news spread that he allowed humans to land on Sanghelios; this caused many keeps to ally with the Servants of Abiding Truth and the tide turned in their favor. The Arbiter was caught off guard and when his own reinforcements couldn't arrive on time, he reluctantly accepted Admiral Terrence Hood's offer for help in fending off the attackers. The tide turned when the UNSC's new flagship, Infinity, arrived over Sanghelios and destroyed the rebel destroyer Defender of Faith before finishing off the rebel ground forces with a MAC round. The UNSC Port Stanley, posed as a Kig-Yar pirate ship, destroyed a few of 'Vadam's ships in order to maintain the stalemate between the two factions, granting the Arbiter a Pyrrhic victory. After the battle 'Vadam entered talks to board Infinity. The remnants of the Servants of the Abiding Truth escaped to New Llanelli to regroup. One month later 'Telcam said he would remain on New Llanelli until he convinced more keeps to join his cause or obtained enough ships to destroy those who refuse. The conflicts in Vadam led to other engagements throughout Sanghelios. Unlike the majority of keeps in Acroli, Nes'alun keep was against the Arbiter. While the keep's males left to fight Vadam's forces, the keep females and children were left behind. The elder of Lacalu keep took advantage of this and attempted to seize the keep and its land. The keep's lady, Elar 'Nas, defended the other females and children in a small farmhouse for an unknown length of time. Soon the keep's Unggoy laborers Dengo and Gikak returned along with Evan Phillips, who had been teleported to the nearby Forerunner ruins. Elar allowed Phillips to come inside, armed him, and prepared themselves for another wave of attackers. Soon afterwards Kilo-Five arrived at the keep to retrieve Phillips. Their extraction was stalled when the Tart-Cart, piloted by Lian Devereaux, was attacked by several Type-26 Banshees. After holding off more Lacalu warriors, Vasily Beloi, Malcolm Geffen, and Naomi-010 extracted Phillips in the midst of battle, leaving the women and children to defend for themselves. Elar and her clan were later killed which unsettled Phillips. — Avu Med 'Telcam's final words. Avu Med 'Telcam was assassinated by SPARTAN-G059 on January 21, 2558 on New Llaneli. — Jul 'Mdama's final words as he orders his soldiers to attack Fireteam Osiris, prior to being stabbed multiple times by Spartan Locke. Jul 'Mdama was assassinated by Spartan Locke on October, 2558 on Kamchatka. On October 27, 2558, Jul 'Mdama's Covenant attacked the Elder Council Chamber on Sanghelios, in an attempt to kill Thel 'Vadam. However the Swords of Sanghelios managed to push the Jul's forces back with the aid of the UNSC's Fireteam Osiris led by Spartan Jameson Locke. Spartan Locke helping the Swords of Sanghelios kill the last of Jul 'Mdama's Covenant faction. After the attack on the Elder Council Chamber, the Swords of Sanghelios invaded Jul 'Mdama's final stronghold, the city of Sunaion, in an attempt to finally wipe out Jul 'Mdama's Covenant. Despite the Covenant's efforts, they were defeated, the battle ended with the Covenant's dissolution and its members being hunted to the last man.